SERDANG, 26 April 2018: Boon Siew Honda (BSH) today officially launched the Honda X-ADV and CRF1000L Africa Twin, the long waited Honda big bike to be introduced in Malaysia. Besides, BSH also takes the opportunity to showcase the latest Honda big bike Neo Sports Cafe – CB1000R at MAI Malaysia Autoshow 2018. Conceived and developed by Honda’s R&D team in Italy, the X-ADV is an innovative crossover that combines modern convenience with rugged adventure capabilities. The X-ADV is fitted with an efficient 745cc liquid-cooled, 4 stroke, OHC. Designed to deliver peak power of 40.3kW @ 6,250rpm with maximum torque of 68Nm @ 4,750rpm. Another addition to the X-ADV is Honda Selectable Torque Control (HSTC). It features 2 Levels; Level 1 allows some rear wheel spin on gravel or dirt while Level 2 provides confidence-inspiring traction on slippery roads. Honda’s Dual Clutch Transmission (DCT) selects lower gear ratios for smarter response in D mode; 3 levels of S mode are available with shift patterns to allow sportier riding. For 2018, a G Switch has been fitted to enhance the off-road performance. The X-ADV is also equipped with 21L of storage capacity under the seat, a 5-way adjustable screen for greater wind and weather protection, tapered aluminum handlebar, Africa Twin hand guards, Rally-style instrument display and Smart Key system. An immobilizer is fitted as standard and a clutch mechanism in the main switch stops the handlebars unlocking by force. A centre stand with tilt sensor is fitted as standard and allows the X-ADV to be parked on an incline without fear of toppling. Long travel suspension, front and rear, absorb any road shock, backed up by rugged 17-inch/15-inch front and rear spoke wheels and block-pattern tyres. Dual radial-mount four-piston calipers provide ample braking power with ABS control. The new X-ADV is available in five color options – Candy Chromosphere Red (new for 2018), Digital Silver Metallic, Matt Bullet Silver, Pearl Glare White and Grand Prix Red. A touring bike that makes long-distance travels pleasant and comfortable, while making it possible to detour onto dirt roads or rough terrain. The new Africa Twin delivers nearly 1.5-times the power output of its predecessor, the original Africa Twin, while maintaining the same size and proportions. A significant upgrade to the 998cc Liquid-cooled, 4 stroke, OHC is the new Throttle By Wire (TBW) system, which expands the choices available to the rider to manage engine output and rear wheel traction to suit different riding conditions. The system features 7 Levels – from Level 1, for aggressive riding off-road on block pattern tyres, to Level 7 for maximum sense of security on slippery, wet tarmac. Alongside the enhanced power delivery, the CRF1000L Africa Twin now comes with new intake design and exhaust to aid mid-range response, lighter balance shaft weight, new lithium-ion battery that saves 2.3kg and enhances durability, as well as Assist/slipper clutch that helps upshifts and downshifts. Also new is an extended range of Honda Selectable Torque Control (HSTC) input setting that ensures a sense of security in wide-ranging situations. The unique Dual Clutch Transmission (DCT) features super-fast, seamless gear changes in Manual Transmission (MT) or Automatic D mode. D mode which is ideal for city and highway riding offers the best balance of fuel economy and comfort whilst S mode gives three different, sportier shift patterns to choose from. Addition of the G button allows the rider to modify the control of the clutch system to give a more direct drive in any riding mode. The CRF1000L Africa Twin is available in Grand Prix Red (Team HRC Rally colour) and Pearl Glare White (Tricolor) for Adventure Sports. Honda BigWing made its debut on 4 February this year with it first opening in Malaysia at Setapak, Kuala Lumpur. With a distinctive new concept designed to be “The Destination for Riders”, Honda BigWing serves as an integrated state-of-the-art showroom, service centre, parts and accessories corner and customer lounge to provide a premium all-round customer experience. This includes the best products and services, comprehensive variety of activities and exclusive Honda customer privileges. 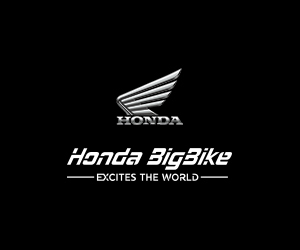 The second Honda BigWing is scheduled to open in Georgetown, Penang under Taycon Motor Sdn Bhd in June 2018, followed by Welly Team Cycle Sdn. Bhd. in Petaling Jaya, Selangor and Additional Growth Sdn. Bhd. in Danga Bay, Johor.